Abu Dhabi: President His Highness Shaikh Khalifa Bin Zayed Al Nahyan, has bestowed the First Class Order of Zayed II upon Monsignor Yoannis Gaid, the Personal Secretary of His Holiness Pope Francis, Head of the Catholic Church, in appreciation of his efforts leading to the success of peace initiatives and spread of the culture of peaceful coexistence among followers of different religions. His Highness Shaikh Mohammad Bin Zayed Al Nahyan, Crown Prince of Abu Dhabi and Deputy Supreme Commander of the UAE Armed Forces, presented the Order to Monsignor Gaid during the February 3-5 visit of Pope Francis to the UAE. Shaikh Mohammad appreciated the role played by the Pope’s personal secretary in promoting the culture and values of fraternity, harmony and coexistence among people, highlighting the importance of the role of men of peace, tolerance and fraternity. Shaikh Mohammad also called for honouring them for their efforts in this respect. 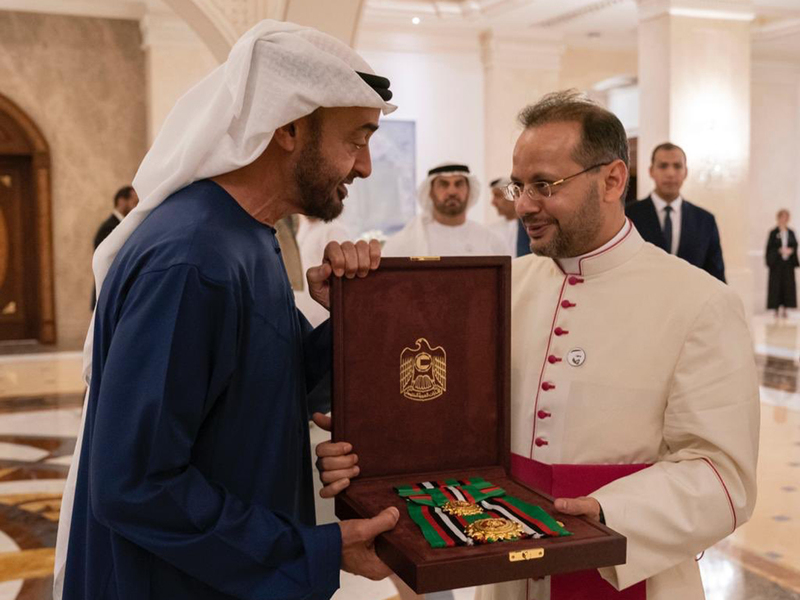 For his part, Monsignor Gaid expressed his delight at being honoured with this Order and applauded the UAE’s role in spreading human values of different religions for promoting goodness and cooperation.